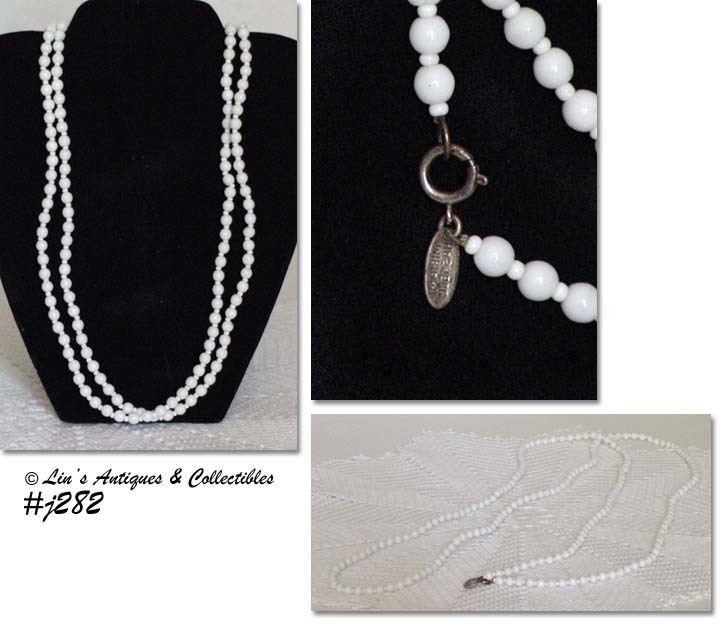 AS YOU CAN SEE FROM OUR VINTAGE JEWELRY LISTINGS, I AM PARTIAL TO WEISS ITEMS! 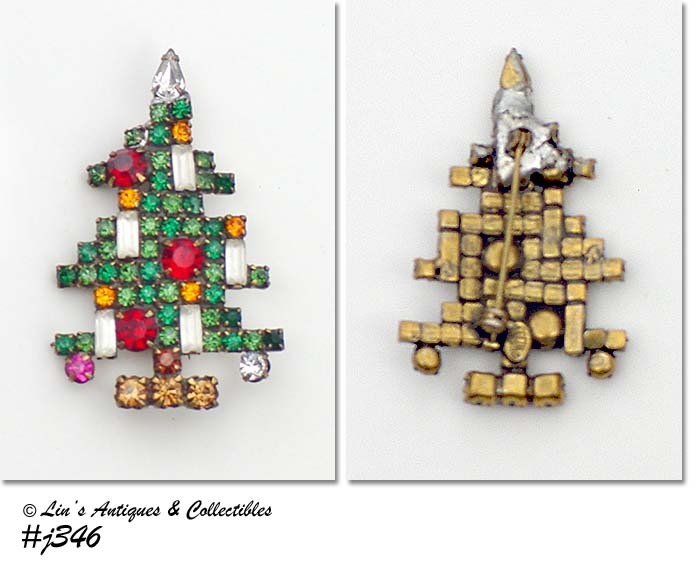 THIS TREE PIN IS FROM MY COLLECTION AND IT IS THE VERY DIFFICULT TO FIND “CANDLE” TREE PIN. MEASURES 2 ¼” LONG, 1 3/8” WIDE (AT WIDEST) AND BACK IS MARKED WEISS. RHINESTONES ARE PRONG SET AND SPARKLY. THE PIN BACK HAS HAD A REPAIR – ONE END HAS BEEN SOLDERED AND, ALTHOUGH NOT ESPECIALLY WELL DONE OR VERY PRETTY, THE REPAIR IS STRONG – SEE PHOTO. THIS IS A BEAUTIFUL PIN, DIFFICULT TO FIND, AND IS PRICED TO REFLECT IMPERFECTION. 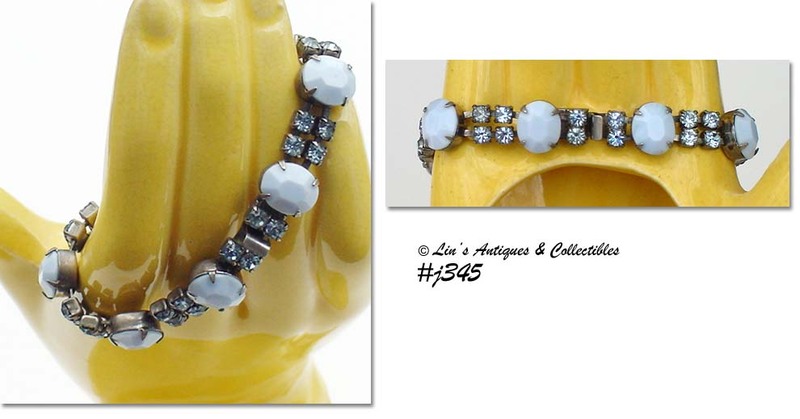 ANOTHER BEAUTIFUL WEISS BRACELET FROM MY VINTAGE JEWELRY COLLECTION! STONES ARE PRONG SET, BRACELET MEASURES 7” IN LENGTH, AND BACK OF CLASP IS MARKED WEISS. EXCELLENT CONDITION! 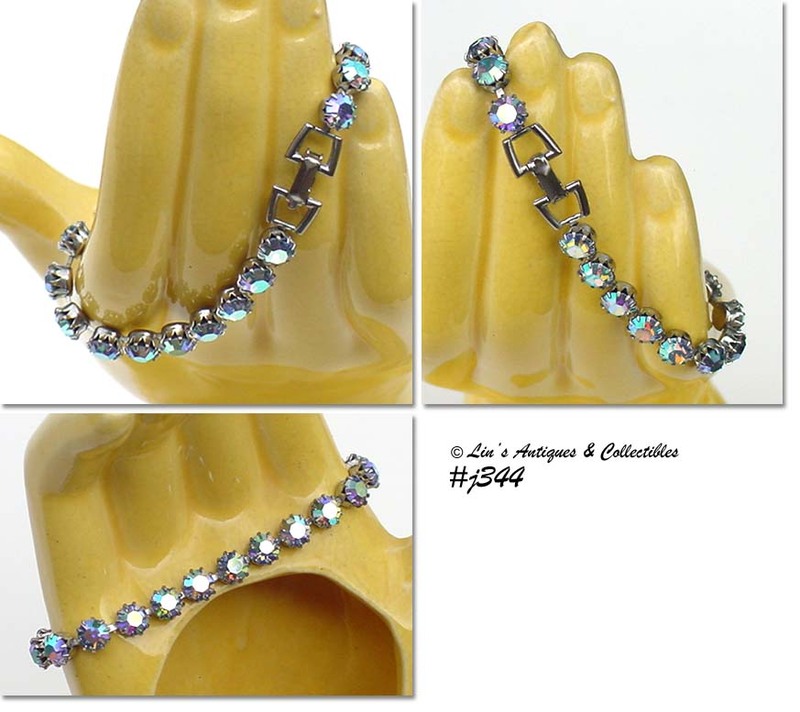 THIS LISTING HAS A GORGEOUS WEISS BRACELET! RHINESTONES ARE PRONG SET AND THE COLOR IS WHAT I CALL ICE BLUE – LOTS OF SPARKLE – A REAL EYE-CATCHER! MEASURES 7” LONG, CLASP IS MARKED WEISS, AND IS IN EXCELLENT CONDITION. 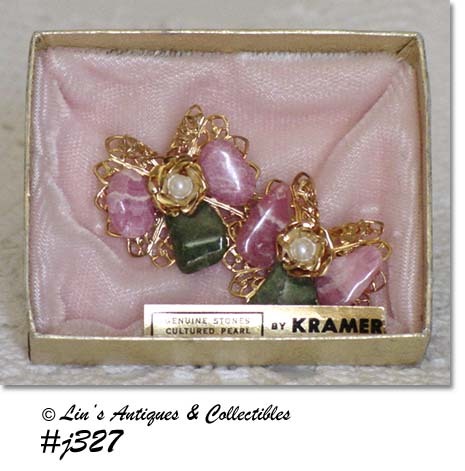 VERY PRETTY PAIR OF PINS BY KRAMER! 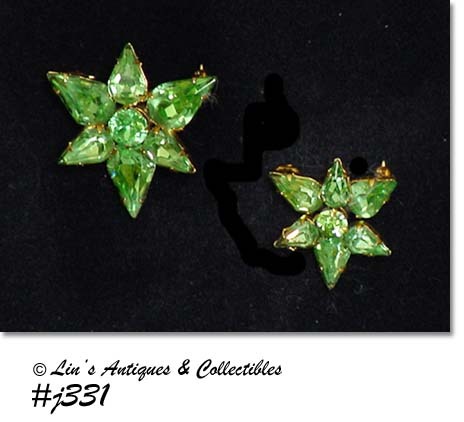 SHAPED LIKE STARS WITH GREEN RHINESTONES, THE LARGER PIN MEASURES 1 1/8” X 1 1/8”, THE OTHER ONE MEASURES ¾” X ¾”. BOTH ARE MARKED KRAMER AND ARE IN EXCELLENT CONDITION. THESE LOVELY KRAMER PINS HAVE BEEN A PART OF MY JEWELRY COLLECTION FOR A NUMBER OF YEARS – I NEVER WORE THEM! THE PINS ARE VERY DIFFERENT THAN MOST KRAMER JEWELRY – THEY HAVE NO RHINESTONES! I THINK THE PINS ARE SHAPED LIKE LITTLE ANGELS, MADE OF GOLD-TONE METAL WITH GENUINE STONES (APPEAR TO BE JADE AND ROSE QUARTZ) WITH A CULTURED PEARL FOR THE “FACES”. BEAUTIFUL ITEMS, VERY INTERESTING EYE-CATCHERS! AREN’T THESE JUST SUPER EARRINGS! 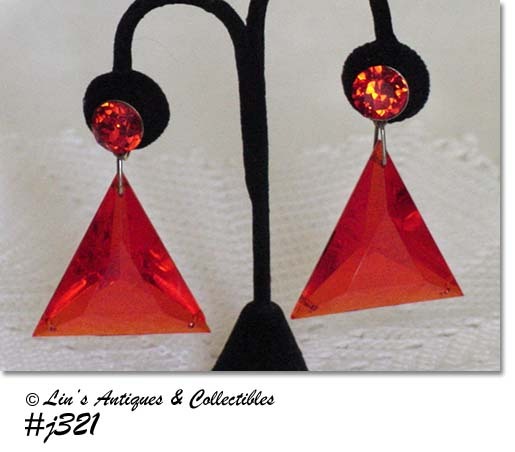 CLIP BACK STYLE MADE BY VOGUE WITH ORANGE RHINESTONE AND TRIANGLE SHAPE ACRYLIC ORANGE COLOR DANGLE. MEASURE 2 ¾” LONG AT LONGEST, TRIANGLE IS 2” X 2”. EACH TRIANGLE HAS A SMALL ORANGE COLOR RHINESTONE IN THE 2 LOWER CORNERS FOR A LITTLE ADDED “SPARKLE”. THESE ARE BOLD, BRIGHT EARRINGS – VERY MOD! WHAT A FIND – THIS IS A PRETTY FAUX PEARL SARAH COVENTRY NECKLACE IN ITS ORIGINAL BOX! THE DISPLAY CARD SHOWS COPYRIGHT 1961, SARAH COVENTRY, INC., ONE ‘N ONLY, 8726, SARAHGLO. CHAIN IS NICE AND SHINY, MEASURES 16” IN LENGTH. BACK OF BOX HAS “SARAH COVENTRY, INC, NEWARK, NEW YORK STATE, THE EXCITING NAME IN FASHION JEWELRY”. NEAT AND COLLECTIBLE ITEM!! YET ANOTHER MIRIAM HASKELL NECKLACE! THIS ONE IS 16” IN LENGTH, MADE OF WHITE GLASS ROUND BEADS THAT ARE OF 3 SIZES WITH GLASS BEAD SPACERS, AND HAS 2 ROUND FLAT GLASS DISC SHAPES FOR FOCUS. NECKLACE HAS THE PATENTED HASKELL PUSH/PULL CLOSURE AND METAL HANGTAG STAMPED MIRIAM HASKELL. AS WITH ALL THE HASKELL JEWELRY WE’VE JUST LISTED, THIS IS FROM MY EXTENSIVE VINTAGE JEWELRY COLLECTION. I’VE COLLECTED FOR YEARS AND IT’S TIME TO MAKE THESE WONDERFUL ITEMS AVAILABLE TO A NEW OWNER! THIS IS ANOTHER UNUSUAL HASKELL NECKLACE! IT’S MADE OF WHITE GLASS BEADS SEPARATED BY WHITE GLASS BEAD SPACERS AND IT MEASURES 60” LONG! NECKLACE HAS METAL MIRIAM HASKELL HANG TAG AND A C TYPE CLASP CLOSURE. VERY NICE ALICE CAVINESS BRACELET! 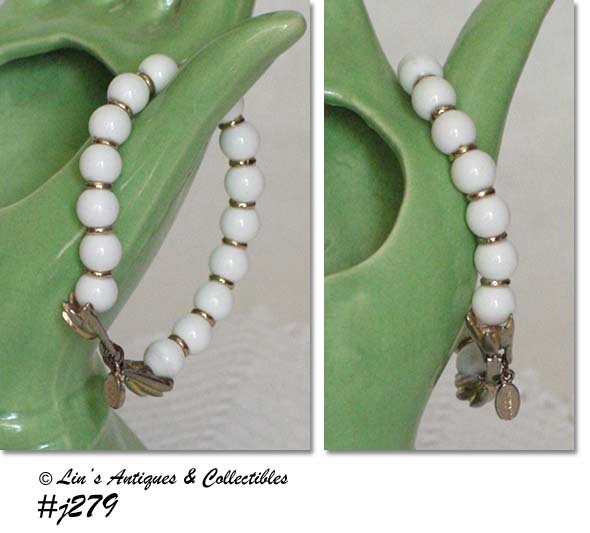 MEASURES 7” LONG, BRACELET HAS ROUND SHAPE WHITE BEADS SEPARATED BY GOLD COLOR SPACERS, FOLD OVER CLASP AND FINDINGS ARE GOLD-TONE (HAVE MINOR COLOR WEAR/LOSS), AND HAS HANG TAG STAMPED ALICE CAVINESS. NOT YOUR EVERYDAY FIND! ABSOLUTELY BEAUTIFUL MIRIAM HASKELL NECKLACE! MADE OF CLEAR GLASS FACETED BEADS WITH SMALL CLEAR GLASS SPACER BEADS, NECKLACE IS 22” IN LENGTH. THE PENDANT MEASURES 1” X ¾”, IS MADE OF LUCITE, AND IS 6 SIDED AND FACETED. THE NECKLACE HAS SILVER-TONE PATENTED HASKELL PUSH/PULL CLOSURE, STAMPED MIRIAM HASKELL AND HAS SILVER-TONE HANG TAG THAT IS ALSO STAMPED MIRIAM HASKELL – THESE APPEAR TO BE STERLING BUT ARE NOT MARKED. FROM MY COLLECTION. MARKED WHITING DAVIS. INTAGLIO CAMEOS ARE CLEAR LUCITE (?) AND ARE NICELY DONE. NICE SET! BEAUTIFUL AND UNUSUAL WHITING DAVIS PIECES! 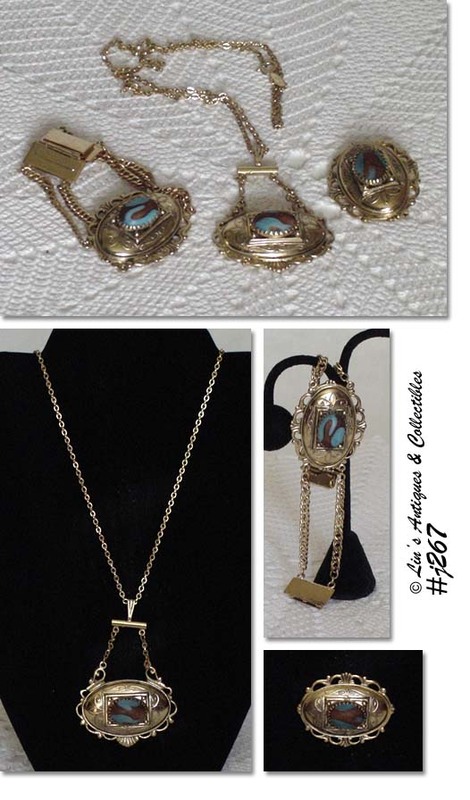 THERE’S A 22” NECKLACE, THE PENDANT IS ANOTHER 2 ¾” AND THERE’S A MATCHING BROOCH AND BRACELET. THE NECKLACE HAS A METAL HANGTAG MARKED WHITING DAVIS, PIN AND EARRINGS ARE UNMARKED. ALL PIECES ARE IN EXCELLENT CONDITION AND ARE OF THE EXCELLENT QUALITY PRODUCED BY WHITING DAVIS! EXTRA NICE WEISS SET! 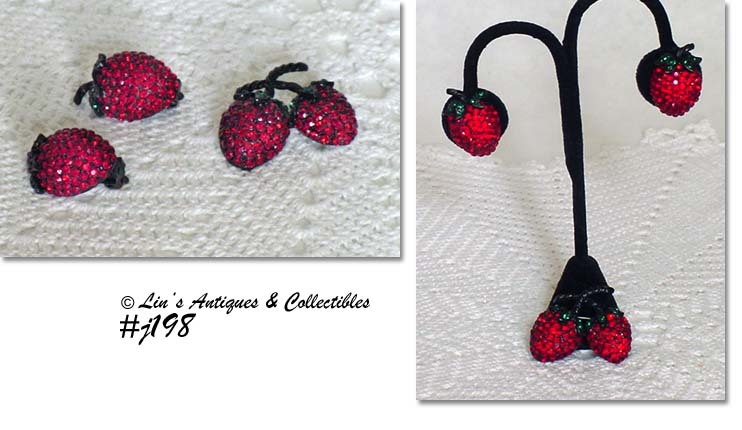 EARRINGS ARE CLIP STYLE AND ARE SHAPED LIKE A STRAWBERRY -- HAVE RED RHINESTONES ON "BERRY" PART AND GREEN RHINESTONES ON "CAPS". THE MATCHING PIN IS OF 2 STRAWBERRIES WITH OVERLAPPING STEMS, RED RHINESTONES ON "BERRIES" AND GREEN RHINESTONES ON "CAPS". ALL PIECES ARE MARKED WEISS. ALL STONES ARE PRESENT AND UNDAMAGED. 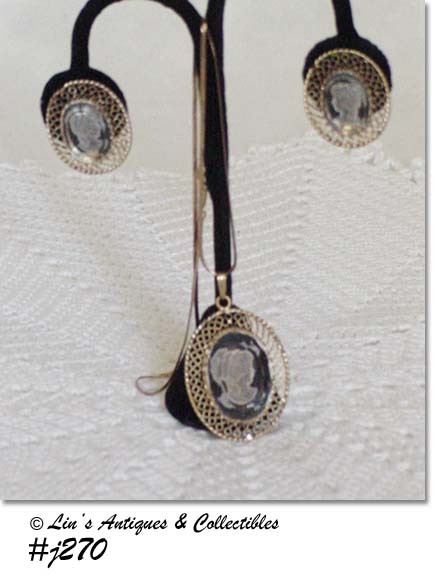 THESE ARE “BOOK” PIECES AND CAN BE SEEN IN "COSTUME JEWELRY" BY FRED REZAZADEH.